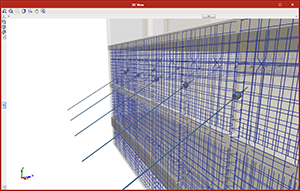 StruBIM Embedded Walls is the new version of Embedded Retaining Walls that is integrated in the Open BIM workflow. Both programs have the same features, and design and check different types of embedded walls (reinforced concrete, pile, mini pile, steel sheet pilings and generic embedded walls) for building and civil works. StruBIM Embedded Walls is downloaded exclusively from the BIMserver.center platform. 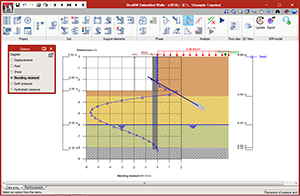 Users whose license is updated to the 2018 version of “Embedded Retaining Walls” can also use “StruBIM Embedded Walls” with any of the modules they have acquired. To do so, they will simply have to copy the permits of their local physical or electronic license key to BIMserver.center. The workspace of StruBIM Embedded Walls is slightly different to that of Embedded Retaining Walls. 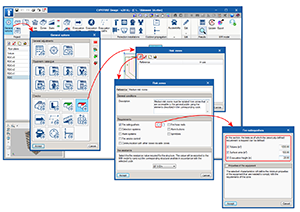 The buttons that represent the program tools look and have been organised differently, although they have the same functions. 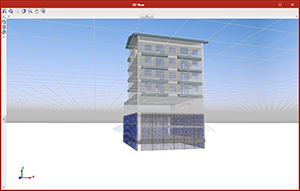 The advantage of using StruBIM Embedded Walls is its integration in the Open BIM workflow. 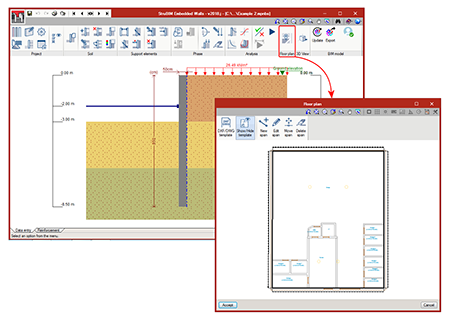 StruBIM Embedded Walls includes an additional tool that allows users to define the path of the walls on plan (with the option to import DXF or DWG files). This way, when the project is exported to the BIM model, each span of the wall will be placed at its position in the architectural model. StruBIM Embedded Walls exports the anchors and elements that correspond to each type of wall (concrete volume, reinforcement, piles, mini piles or steel sheet pilings) to the BIM model. More information will soon be available on the “StruBIM Embedded Walls” webpage. As of the 2018.i version, CYPE programs integrated in the Open BIM workflow generate models with “GLTF” format (GL Transmission Format) that are exported to the BIMserver.center platform together with the corresponding “IFC” format file. The standard and open GLTF format, offers greater interoperability possibilities between applications dedicated to the generation and visualisation of 3D content. This way, CYPE joins other companies that have adapted the GLTF format such as Google, Microsoft, Adobe, Oculus and NVIDIA. 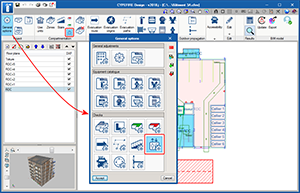 The generation of these models from CYPE applications allows users to have a direct view from the viewer that is integrated in the BIMserver.center web platform and in the application for mobile devices. 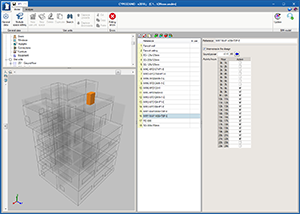 As of the 2018.i version, StruBIM Embedded Walls has been added to the BIMserver.center platform where it can be downloaded by users. Code of Practice for Design Loads (other than earthquake) for Buildings and Structures. Part 3 – Wind Loads. 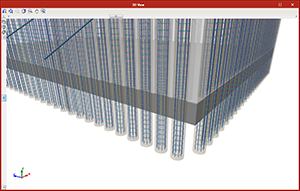 The 2018.i version of CYPECAD includes the automatic generation of concrete columns based on the columns of the BIM model. The program will generate a rectangular or circular concrete column of the same size and at the same position for each column that has been defined in the BIM model. To do so, the assistant that is activated when a project is created from a BIM model, contains the new stage “Columns”. In this stage, users can select the columns that are to be generated depending on their material. 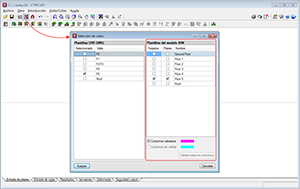 The assistant generates the columns with the same reference they have in the BIM model or with an automatic reference. In this stage, users can also select the type of support (with or without external fixity) columns starting at the first level will have. Columns starting on higher floors will be generated without external fixity. The fixed point of the column will also be generated in accordance with the fixed point of the column of the BIM model. When users decide to update the BIM model with the changes the architectural model may contain, any columns that have been generated previously will not be modified. Neither will their position be changed nor will they be deleted nor new columns added, even though these changes have occurred in the BIM model. What is updated is the template of the BIM model and it is up to users to decide what to do when a column has been moved, deleted or introduced, as this affects intersections with the beams, columns and floor slabs that have already been introduced in CYPECAD. In the previous version (2018.h), the way CYPECAD acts when a column is added or an existing column is moved was modified. 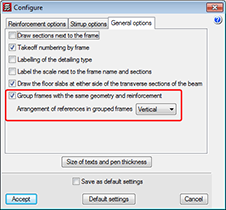 As of this version, CYPECAD does not automatically recreate column-beam intersections and users can choose to recreate the intersections manually or have the program recreate them automatically for a floor using the “Reload group” option. 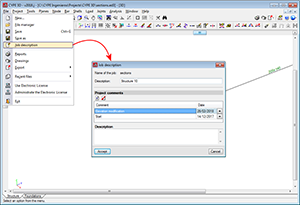 To be able to introduce a column that interprets another column of the BIM model that was not present when the connection of the CYPECAD project to the BIM model was launched (after the first import), the tool, “New column (BIM)” has been implemented. 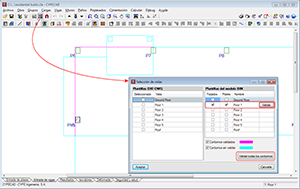 When this option is selected, the outlines of all the columns of the BIM model will appear. Then, if we click on one of these outlines, a column will be generated with the same dimensions as the column of the BIM model on each floor. 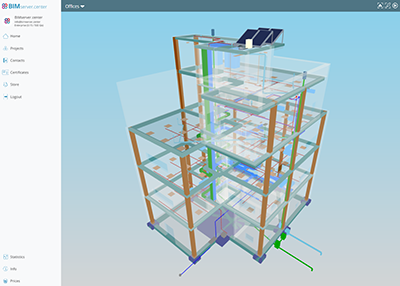 Users must bear in mind that including a new column may interfere with beams that are already present in floors of the CYPECAD project. 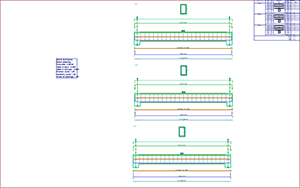 Nonetheless, how the program behaves, regarding the automatic adjustment of beams, when a new column is introduced or an existing one is moved, was modified in the previous version of CYPECAD (2018.h). As of that version, the program does not automatically recreate column-beam intersections. 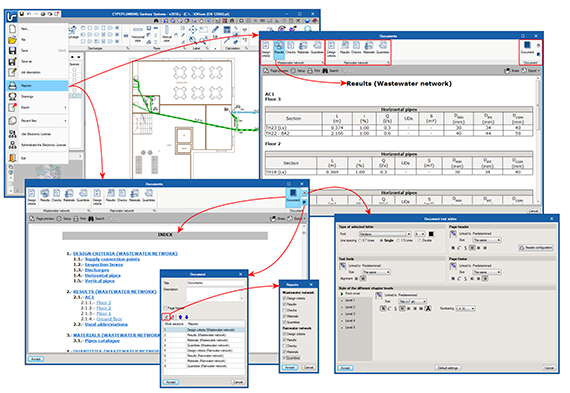 Users can recreate them manually or use the “Reload group” option (“Beam Definition” tab > “Groups” menu) to recreate them automatically in the current floor group. The DXF or DWG templates associated with the BIM model. Furthermore, when a BIM project is launched from IFC Builder, users can automatically export a template in DXF format with the outline of each floor. The templates of the “BIM model” that display the outlines of the floor slabs and outlines of the columns. These are updated when the BIM model is updated if the initial model has any changes. 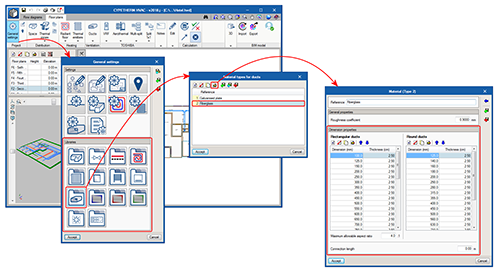 The views of the DXF/DWG templates (including those IFC Builder may generate in the BIM model) can be managed from the “View selection” dialogue box. 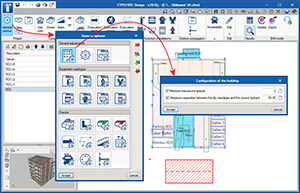 As of the 2018.i version, another section appears in the same dialogue box in which users can also manage the templates of the BIM model. The templates of the BIM model will be shown in magenta when they are generated for the first time (validated outlines). 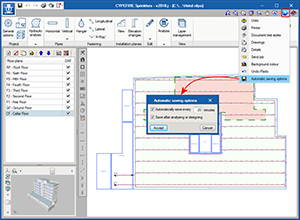 When the BIM model is updated, new outlines or outlines that have undergone any changes will be displayed in cyan (Outlines not validated). 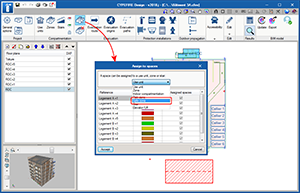 In the “View selection” dialogue box, users can mark “Outlines not validated” outlines of the BIM model (cyan) as “Validated outlines” (magenta). With this improvement, the outlines before the update can be clearly distinguished from the new outlines and so graphically appreciate the changes the architectural model has undergone. 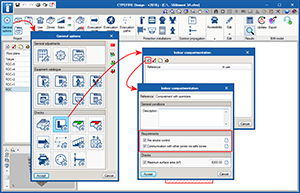 The behaviour of the program when opening projects, regarding the visibility of templates in DXF or DWG format, or those of the BIM model, has been modified. In previous versions, when projects were loaded, the visibility of all the templates assigned to the “Column Definition” and “Beam Definition” templates was maintained. As of the 2018.i version, when a project is opened, this visibility is deactivated. The reason for this change is because projects containing visible templates take longer to open, the time required being greater the larger the templates are and the larger the number of visible templates that are present. With this new behaviour, projects are loaded more quickly. 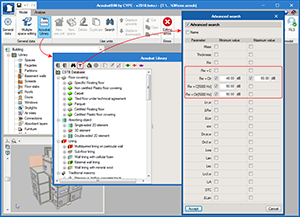 Users can easily activate or deactivate the templates (DXF, DWG or BIM model) assigned to each floor or at the “Column Definition” tab by pressing the F4 key. 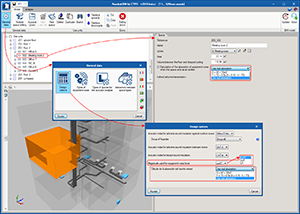 An option has been included where users can indicate whether or not frames with the same geometry and reinforcement should be grouped in frame drawings (Frame drawings > Configure > General options). In previous versions, the program always grouped frames with the same geometry and reinforcement. The possibility to add comments to the project has been implemented. The comments are managed in the “Job description” dialogue box (File > Job description). 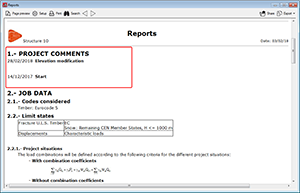 The comments users add can be included in the Project report. This improvement allows, for example, users to manage a history of comments, modifications or revised versions of the project. 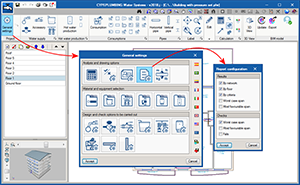 The 2018.i version of CYPEPLUMBING Sanitary Systems (also the 2018.i version of CYPEPLUMBING Water Systems) includes a documents manager where users can view all the reports that are generated by the program. With this manager, users can create a document that includes selected reports, and then print it, export it to various format files (PDF, DOCX, Text, HTML, RTF) or attach it to the BIM project in PDF format (see the section on Export documents to the BIM project). The reports users can include in this document are organised in chapters with their indices and in the order they wish for them to be. It is also possible to configure the document headers and styles. 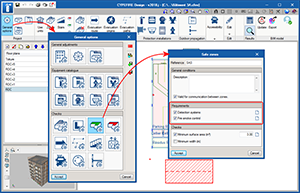 Here users can specify all the design options corresponding to the selected code or customise the design options. In previous program versions, the program could generate a report of all the checks that have been carried out on the selected span (one by one). The checks report that is implemented in the 2018.i version gathers all the checks of all the spans. The materials report is created with the material catalogues that are used to design the project. The “Results” report and the new “Checks” report can be configured. Now, users can organise the information of the results report (by network, by floor, by criteria and/or by main span) and include the checks of the most important spans (main span and/or spans that fail checks), independently for the wastewater and rainwater networks. 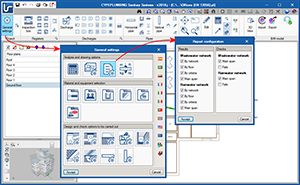 CYPEPLUMBING Sanitary Systems allows users to export the quantities of the project to the BIM model in FIEBDC-3 standard format (so it can be treated by bill of quantities programs such as Arquimedes) and the document configured by users using the Document manager (also implemented in this version) in PDF format. 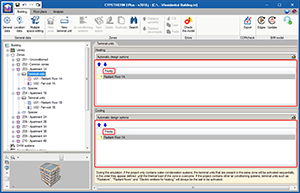 The 2018.i version of CYPEPLUMBING Water Systems (also the 2018.i version of CYPEPLUMBING Sanitary Systems) includes a documents manager where users can view all the reports that are generated by the program. With this manager, users can create a document that includes selected reports, and then print it, export it to various format files (PDF, DOCX, Text, HTML, RTF) or attach it to the BIM project in PDF format (see the section on Export documents to the BIM project). The reports users can include in this document are organised in chapters with their indices and in the order they wish for them to be. It is also possible to configure the document headers and styles. Implemented in the design criteria report is the simultaneity information described in the design options defined by the selected code and by the possible technical customisation users can carry out. Additionally, the 2018.i version allows users to introduce customised descriptions in the checks report for each span and in general. As of the 2018.i version of CYPEPLUMBING Water Systems, the “Results” report and the new “Checks” report can be configured. Now, users can organise the information of the results report (by network, by floor, by criteria and/or by main span) and include the checks of the most important spans (main span and/or spans that fail checks). 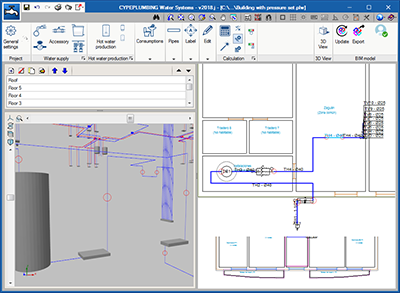 CYPEPLUMBING Water Systems allows users to export the quantities of the project to the BIM model in FIEBDC-3 standard format (so it can be treated by bill of quantities programs such as Arquimedes) and the document configured by users using the Document manager (also implemented in this version) with PDF format. 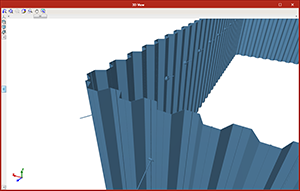 The program generates, in the 3D view, any vertical spans that join two elements introduced in the same floor but with different elevations. This already occurred as of the 2018.g version for consumption elements. These elements are introduced in the same floor plan as the pipe that feeds them. In the 3D view they appear joined by a vertical span without the need to have to manually introduce it. Now, these vertical spans are also generated between pipes with different elevations or between other elements to which users assign a different elevation to that of the plane along which the pipe runs (connections, meters, tanks, pressure groups ...). 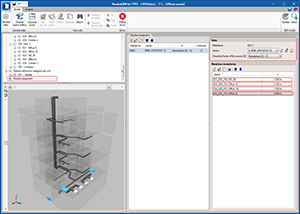 The vertical spans that are generated automatically by the program are drawn in the 3D view in a slightly lighter colour than the pipes and verticals spans introduced by users. The vertical spans that are generated will have the same diameter as the pipe from which they descend. If users wish to modify their diameter, the vertical span must be introduced manually using a vertical pipe. 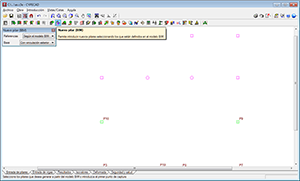 In the attached image, the vertical spans that have been generated automatically are marked with a red circle (both in the 3D view and in the plan view). The way in which equipment outside the analysed is defined has been improved. 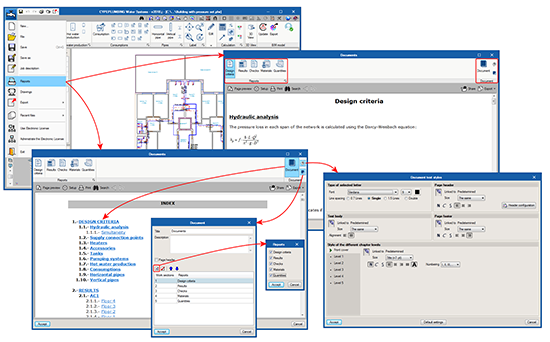 Now, instead of indicating the presence of the outdoor sound source in each affected space, a new section has been created in the “Model” tab in the tree diagram of the building, where users can introduce them once. For each set of outdoor equipment, users must indicate its type, directivity factor (Q) and the spaces that are affected as well as the value of the distance of the closest façade to each space (r). 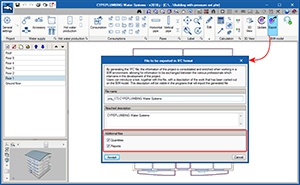 Implemented in the 2018.g version of CYPESOUND was the functionality of reading and interpreting the indoor sound sources defined in an IFC file included in the BIM model. The same task has now been carried out for outdoor equipment such as the outdoor units of VRF, Multi-split and 1x1 Split systems. These devices can be introduced in the BIM model using the CYPETHERM HVAC air-conditioning installations design program. During the import process, the application automatically calculates the values of the parameters r (distance between the source and the closest façade of each affected area) and D (directivity factor -Q- of the machine) corresponding to each equipment set, which depend on the position of the source and geometry of the building. Rw + C: Sound reduction index of an element, A-weighted [dB]. Rw + Ctr: Sound reduction index of an element for urban traffic noise, A-weighted [dB]. Rw + C [5000 Hz]: Sound reduction index of an element, A-weighted, broadened to 5000 Hz [dB]. Rw + Ctr [5000 Hz]: Sound reduction index of an element for urban traffic noise, A-weighted, broadened to 5000 Hz [dB]. 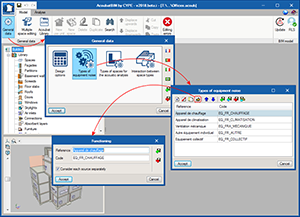 As of the 2018.i version, AcoubatBIM by CYPE allows users to define sources of outdoor noise, which generally correspond to the equipment installed in the building. 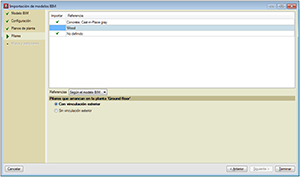 A product from the Acoubat database can be assigned to each type of source and users must indicate the type of noise of the machine, depending on the classes defined in the general parameters of the project. For each outdoor equipment set, users must indicate the distance between the source and the closest enclosure of each affected space (r). Depending on the surfaces close to the source, the value of the directivity factor (Q) of the machine must be established. Now, instead of selecting the operation of each type of equipment (continuous, intermittent or emergency), users can define these options. This way, the application can carry out a more exact interpretation of the different acoustic codes. Additionally, for each type of specific noise, users can indicate if the noise produced by each source is to be evaluated individually (heating or air-conditioning equipment) or collectively (grilles or diffusers of the ventilation system). 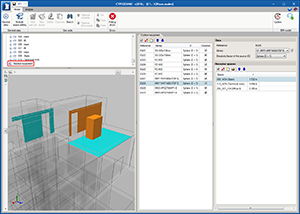 In the 2018.g version of AcoubatBIM by CYPE, the functionality to read and interpret indoor sound sources defined in an IFC file included in the BIM model was implemented. Now, the same task has been carried out for equipment installed outside the building such as the outdoor units of VRF, Multi-split and 1x1 Split systems. These devices can be introduced in the BIM model using the air-conditioning installations program CYPETHERM HVAC. 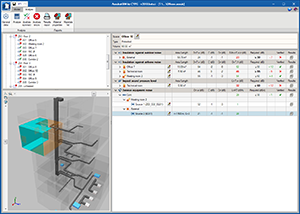 During the import process, the application automatically calculates the values of the parameters: r (distance between the source and closest enclosure of each affected space) and D (directivity factor - Q – of the machine) corresponding to each equipment set, based on the position of the source and the geometry of the building. The acoustic test database of the CSTB has been updated to add new products to the Technical equipment class. 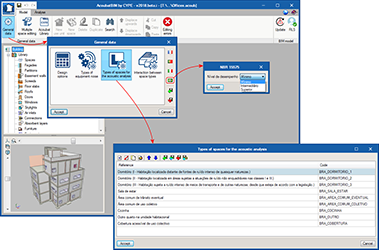 As of the 2018.i version, AcoubatBIM by CYPE allows users to import the configuration of the acoustic limits stated in the NBR 15575 code (Edificações habitacionais – Desempenho). 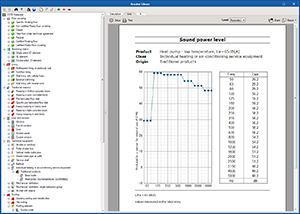 As well as the obligatory compliance levels, users can choose whether to verify one of the acoustic performance levels described in the annex of the code (minimum, intermediate or superior). The histogram the program shows once the program has finished the design process has been improved to offer a greater level of information on the global acoustic behaviour of the building. Now it is possible to inspect the receptor spaces of each class and show the results of each acoustic parameter separately. As well as the graph, a table containing the values that are obtained has been added. Minimum number of manoeuvre spaces that must exist in the project. As occurs with Zones, the limits as of which each requirement is requested are added for risk zones. Additionally, for “Zones” and “Risk zones”, their volume is also added as an additional limit of each requirement. In previous program versions, safe zones were assigned individually for each Use unit (space). This prevented one zone from being assigned to two neighbouring spaces, and hence, the check of the minimum surface area from being carried out on the two bordering spaces as a single space. In the 2018.i version, “Safe zones” are assigned in the same way as are “Zones”, “Risk zones”, “Indoor compartmentation”, “Use units”, “Elevator/Lifts” and “Stairs”. This way, it is possible to group spaces within the same safe zone. Detectors required in the zone. Required installation of fire smoke controls in the zone. This requirement could already be activated for certain types of zones. Now, it can be activated so the indoor compartmentation has, at its communication point with other zones or adjacent indoor compartments, a valid safe zone for the communication (such as independent lobbies). Elevators are added to the general option checks. Now, it is possible to include all space belonging to lifts, define different types of lifts (such as those only to be used for firefighter access) and export this information to the IFC file. 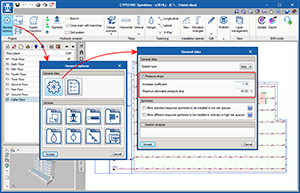 As of the 2018.i version, CYPEFIRE Sprinklers contains two new options for the hydraulic analysis which allows users to calculate any pressure drops in a more precise and controlled manner. 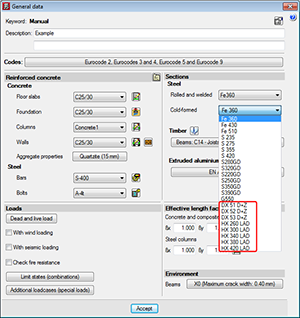 This is a safety coefficient that the program applies to the existing pipe lengths of the program to simulate the pressure drops due to specific elements such as elbows, intersections, T-connections, valves, etc. The value provided by default is 1.15 and represents a pressure drop of 15%. Is the maximum allowable pressure drop produced at any span of the pipe. If the difference in pressure between the initial and final node is greater than the indicated value, a warning will be displayed on the pipe to indicate that it must be redesigned. This option allows users to rapidly detect spans which, due to their dimensions, produce large pressure drops and must be redesigned. The default value is 40%. 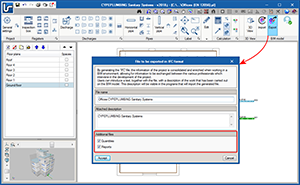 Two options regarding the automatic save of the project have been implemented (Configuration > Automatic saving options). There are two options that can be activated individually or simultaneously. Saves the project automatically each time the indicated period has passed. Saves the project automatically when the installation is designed. During the energy simulation carried out by CYPETHERM programs with the EnergyPlusTM analysis motor, air-conditioning terminal units defined in each thermal zone are activated sequentially until the thermal load of the zone is overcome. In previous versions of these programs, the order of the activation sequence was that in which the terminal units appear in the diagram. As of the 2018.i version, the activation sequence of the terminal units of each zone is defined in their own panel, within Terminal units, and the program distinguishes between air-conditioning and heating. 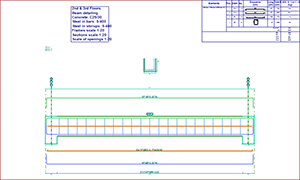 In previous versions, the sizing tables for rectangular and circular ducts which the program used to design these elements, were defined in the “Design options for ducts” menu (General settings > Options > General options). As of the 2018.i version, these tables are defined in the material libraries of the ducts (General options > Libraries > Material types for ducts > edit or add a material). This way, the sizing tables can differ depending on the material that is used.